Grows richer in color with use learn more here. Luxury Leather iPhone X Case With A Story: Yours. It looks like a book, works like a wallet, and ages like a fine wine. Our Heritage Luxury Pocket Book is the trifecta of all things Pad & Quill. As you handle this case, the natural interaction of the materials with your hand leads to a gorgeous hue of the leather over time. You can also speed that up with using the included 1oz tin of leather balm to nourish the leather and guide it towards just the right shade of brown leather you want letting this case become uniquely yours. Some of the oldest most prized books in the world have developed similar patinas, proving that it stands the test of time. To add to the book look, your iPhone X is suspended in a Baltic Birch wooden cradle. Your iPhone easily snaps into place and stays secure in the precision milled hand-finished gleaming wood frame. This beauty sliced from trees is fittingly wrapped in an equally gorgeous cover. One piece of full-grain leather that is stitched with parachute-grade nylon stitching makes up the exterior of this super cool iphone X case. Then, we use more leather to craft the wallet portion on the interior flap. Keep your ID in the ID window, and credit cards or cash in the other slots. Whether you are looking for a case that looks like a book, works like a wallet, or is simply a work of art, the Heritage Luxury Pocket Book will fit your needs. 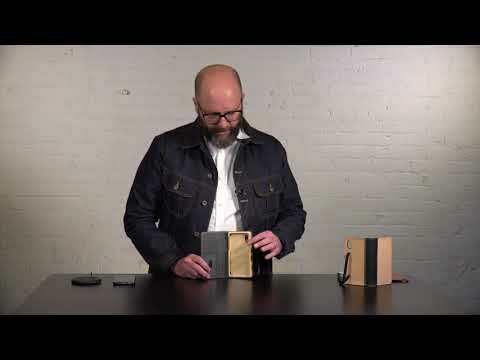 In fact, you might love this leather case so much, that when the next iPhone upgrade is released, you may be hesitant to leave your Heritage Pocket Book behind. It's an occupational hazard of being an exceptional artisan.